This is so fun, I just had to share! 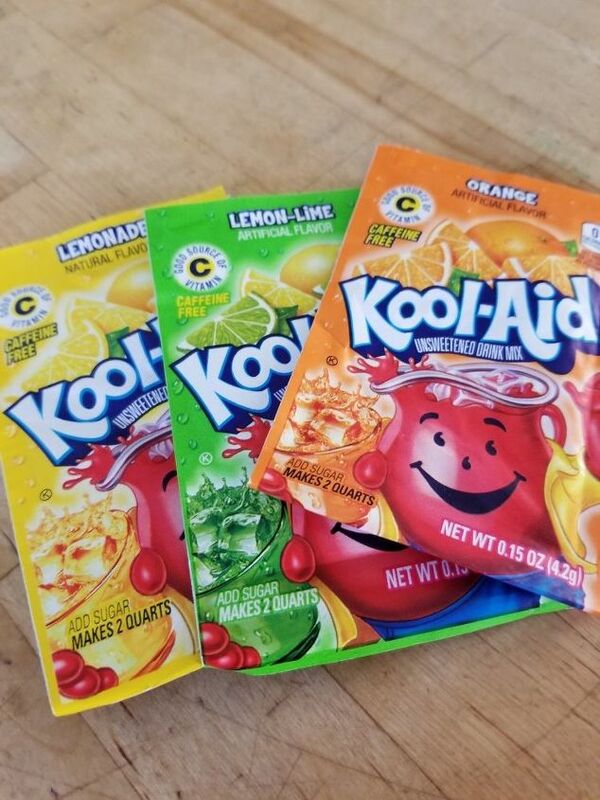 Did you know you can color your Easter eggs with Koolaid? That’s right, at a cost of about 25 cents per packet you can dye your Easter Eggs AND tackle some of your Spring Cleaning! Mix one packet into 2/3 of a cup of cool water, 1 Tablespoon Vinegar and stir until dissolved. THEN use the leftover liquid to SPRING CLEAN! It doesn’t matter what color- they all work just fine because of the citric acid! Some Kool-Aid liquid goes in the empty washing machine (without clothing) to clean the inside and keep the smells away. I have the front load type so I pour it in at the fabric softener area since I get moldy discoloration there. If you have alot of discoloration make a paste (mentioned further down) and use a toothbrush to scrub at it. You can also use some in the dishwasher- run it through a cycle with dishwasher detergent. Also dump some down the garbage disposal for a fresh smell! Some Kool-Aid liquid goes in the toilet- let it soak, scrub all around and flush! The longer it soaks, the better. I have a really ancient icky toilet but it does make it look a lot better! And no- it doesn’t stain because the toilet is a non-porous surface. I make a paste with the Kool-Aid liquid and baking soda to loosen up the hard water deposits around the sink faucets and in the basin. It doesn’t stain because the metal faucets and porcelain sink are non-porous surfaces. If I have stains on my counter tops I use a bit to scrub the stain away but don’t let it set because some counter tops are a bit porous and could stain. Scrub and wipe clean. I also put some into a spray bottle with liquid Dawn dish soap and additional water to spray clean the counters, the shower walls, etc. It will not stain non-porous surfaces! You can even use it on windows! And yes, dump the last of the Kool-Aid down the drains in the house to do some final cleaning! So…what did you think of the post?? Do you think you will try??? I love the cleaning tips, but the Easter Egg coloring is awesome! Fun post! The vinegar in the Kool-Aid mix is a real key to the cleaning. I like your dragon faucet and the baking soda paste. Does the vinegar and baking soda in this mixture react? Yes it does! Have you ever poured some baking soda in your sink. Then add vinegar…love how it reacts. Kids get a kick out of watching it too! Thank you Michelle! Love your organizing tips!! I wish I had kids to try this with, but shared it on my Facebook page for family and friends.